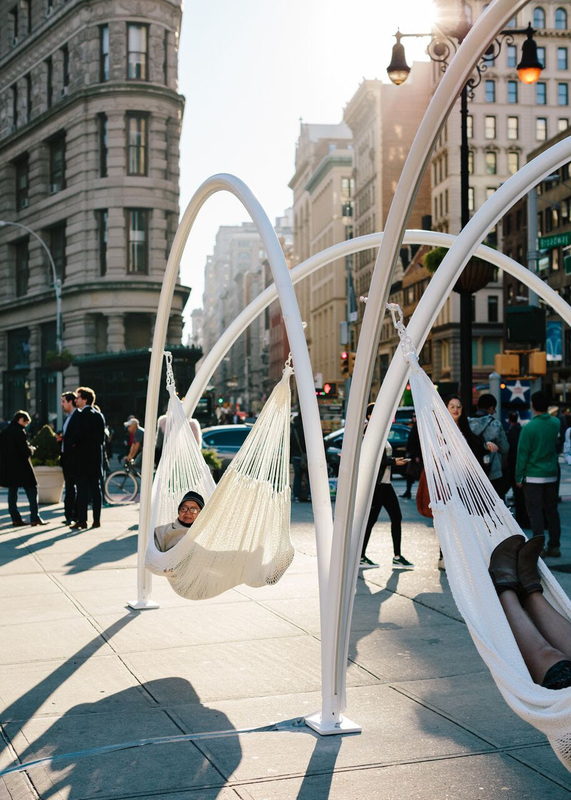 On a blustery night this week, local architects and members of the public came out to relax in hammocks in the middle of 5th Avenue for a festive holiday season kick-off. 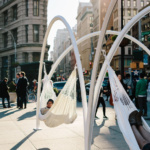 The hammocks, suspended on white powder-coated steel armatures, are part of Flatiron Sky-Line, this year’s winning installation in a contest hosted jointly by the Van Alen Institute and the Flatiron/23rd Street Partnership Business Improvement District (BID). 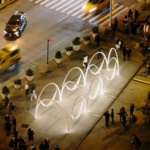 The Flatiron Public Plaza Holiday Design Competition, now in its third year, asks architects to design a temporary structure for the traffic island at Broadway, 5th Avenue, and 23rd Street, adjacent to Madison Square and with the famous triangular building at its southern edge. 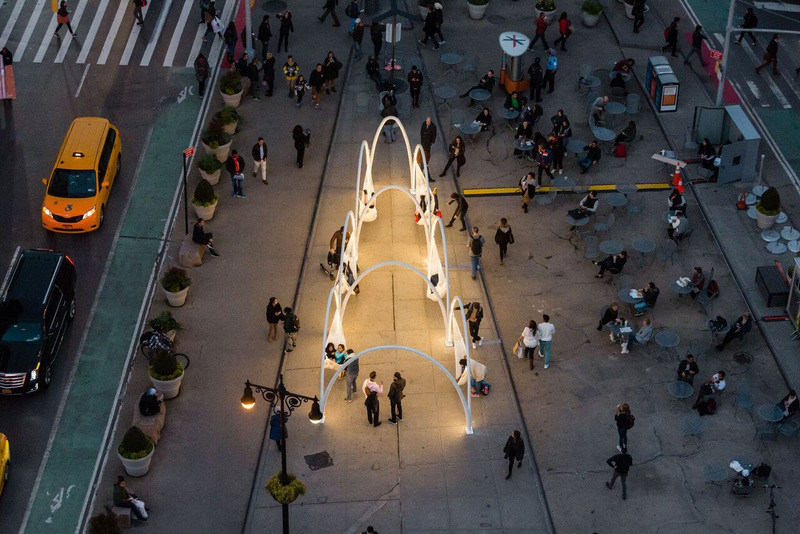 LOT, the New York City– and Greece-based firm founded by Eleni Petaloti and Leonidas Trampoukis, won the invited competition to design a temporary interactive installation that anchors the Partnership’s holiday programming. 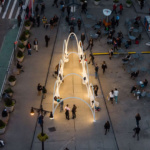 Ten connected arches with strategically-placed mesh hammocks, illuminated with inset LED lights, mirror the form of the Flatiron Building. 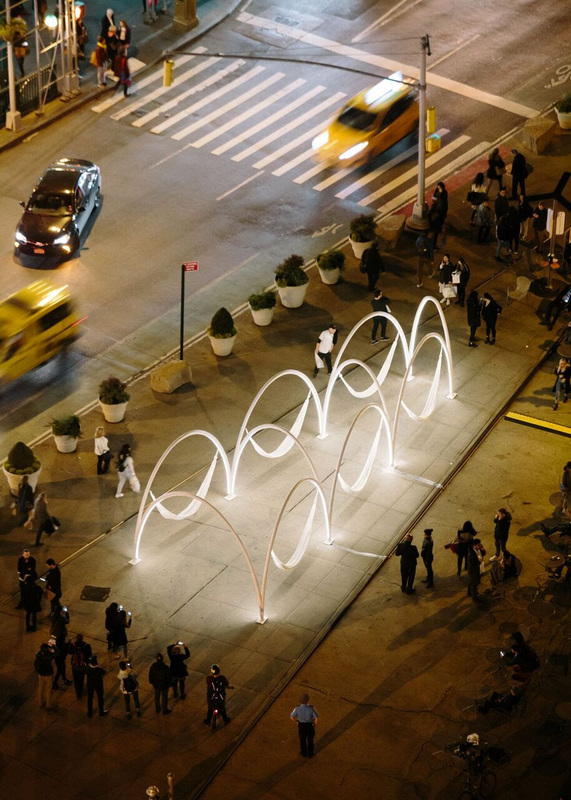 The installation is open every day from 9:00 a.m. to 9:00 p.m., as weather permits. See The Architect’s Newspaper’s coverage of the 2014 and 2015 winners here, and here.